Imagine strolling past a 500-kilo humpback whale singing on the beach, a three-metre wide steel crab staring at you from a rock and a set of clasped wiry hands towering high above your head. These are the kinds of creations towed onto the beach each year when the Currumbin foreshore becomes an open-air gallery of around 50 sculptures by Aussie and international artists. Get among the action by heading to the beach with your pooch and a picnic, or join a guided twilight walk for insight into the individual pieces. Artists also stump up along the beach throughout the festival to talk about their inspo and take questions (like, how the heck did you turn a wire-frame whale into a giant piano?). Kids can get their hands dirty with clay-moulding workshops and all visitors are encouraged to vote for their favourite sculpture for the people’s choice award. If you fancy a piece for the backyard, you might even be able to negotiate a price. 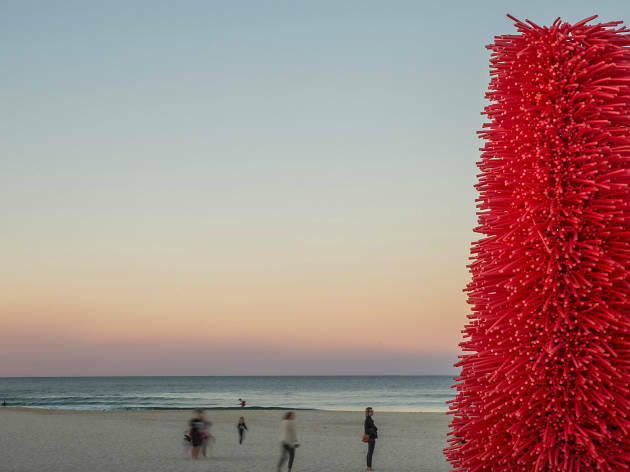 While the exhibition itself is limited to a one-kilometre stretch of sand on the southern Gold Coast, the festival vibes crawl up the coastline, with Surfers Paradise temporarily housing two enormous sea urchins weaved together by 80 crocheters.